If you enjoy running, more power to you. If you hate the thought of running, join the club. Running can be a monotonous, drawn-out, dreadful workout. Not to mention painful, thanks to shin splints, bad knees and sore feet. 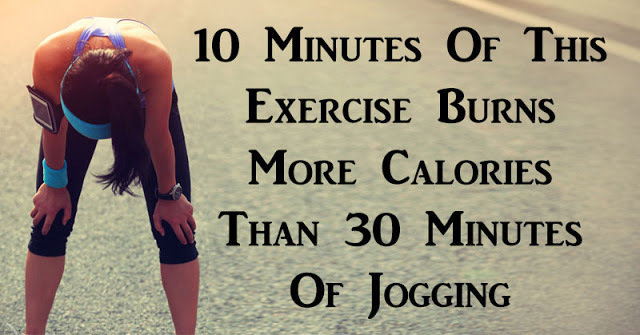 If you’re running to burn calories, I have great news for you: there’s a ten-minute workout you can do instead, that burns more calories than 30 minutes of running! You only need one thing: a jump rope. Studies suggest that ten minutes of jumping rope is just as effective as 30 minutes of jogging, when it comes to burning calories and cardiovascular improvement. Jumping rope can help you burn fat and build muscle! One of the best parts about a jump rope workout is that you can do it anywhere! It doesn’t require a lot of space or time. “I don’t have time” can’t be used as an excuse when this workout only takes ten minutes! Jump rope in the gym, in your home or in the great outdoors. Jumping rope doesn’t just tone the muscles in your legs. Your arms, legs, back, abs and shoulders are all getting a great workout while you jump! You’re able to tone your muscle while burning stubborn fat. You may have been a pro at jump rope when you were little, but if you haven’t skipped in a while, you might find that it’s not as easy as it looks! Jumping rope improves your coordination, balance and reflexes. Make sure you choose the right jump rope for the job. Purchase one in a sporting goods store where you can ask an associate for advice on choosing the right length, handle and material. Consider wearing shoes without padding or jumping barefoot for comfort. Keep your head straight and look ahead while you jump. Keep your torso straight and your knees slightly bent. Your elbows should be kept close to your body. Grip the jump rope handles with your fingers instead of your palms. Use your wrists to spin the rope, not your arms. Use the front of your feet to propel you and to land. Make sure your heels don’t touch the ground while you’re skipping. You don’t need to jump very high, just high enough to cross the rope. Once you’ve mastered the basic jump, try other rope techniques. If you’re feeling bold, shoot for the double turn, single leg hop or crossover! Watch the video below for a 10-minute fat-burning jump rope workout!